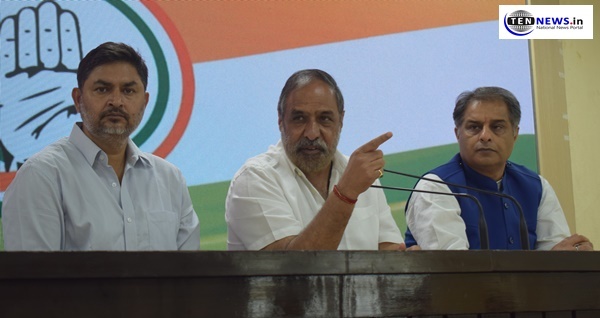 New Delhi : Today, Congress demanded a thorough probe into the alleged transportation of a “suspicious black trunk” in Prime Minister Narendra Modi’s helicopter during his visit to Chitradurg in Karnataka. Anand Sharma, at a conference asked the prime minister to come clean on the issue and said the EC should inquire into the contents of the trunk. He added that the Congress’ Karnataka unit has already filed a complaint with the EC in this regard. “We saw there were three more choppers escorting the prime minister’s helicopter. After landing, a black trunk was taken out and whisked away in a private car which was not part of the SPG cascade,” he alleged. Anand Sharma also asked Modi to give an account of his five-year rule to the people of the country. He also made fun of Union Minister Smriti Irani along with PM Modi and questioned them about the reasons to carry fake degrees of graduation.